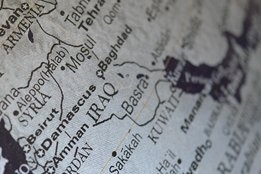 The bunker market in Iraq is set for another boost following news that the country is poised to increase crude oil deliveries to 5 mbbls per day. As previously reported by Ship & Bunker, Al-Iraqia Shipping Services & Oil Trading (AISSOT) launched the new bunkering service last year. "After decades with no vessels, with the development of Iraqi National Shipping Line which completed its maiden crude oil delivery in November last year [we] have ambitious and robust plans," the company says. AISSOT is currently operating seven modern VLCCs and two FSU’s, and says it is ready to deliver 20 mbbls of crude oil per month to customers on delivered basis. The firm is also eyeing further growth ahead with orders for 20 new build deliveries by 2019 and a further 10 new build deliveries in both 2020 and 2021 from yards in Japan and Korea. "As of now AISSOT has successfully bunkered more than 500 ships calling Iraq to load. Prominent customers include most of the Oil Majors and Shipping Companies who prefer to take bunkers after crude oil loadings to avoid diversion to other ports for bunkers thereby saving huge costs and time," says AISSOT. "Soon AISSOT plans to commence berth supplies at Um Qasr Port specially to cater to the needs of Container and Bulkers." The firm also supplies bunkers at Basra and Khor Al-Zubair. The venture, Al-Iraqia Shipping Services and Oil Trading (AISSOT), is a JV of Iraqi Oil Tanker Company (IOTC) and Arab Maritime Petroleum Transport Company (AMPTC). CSA2020 wins Clean Shipping category at this year's Green4Sea Awards. Shipowners won't switch until there's a level-playing field, says Emission Free Shipping Association co-founder David Anink.